In light of Mother’s Day coming up, and any other occasion where you need a thoughtful gift, opting for something from the homeware department can go a lot further than just a scented candle. Buying gifts for the home can be a great way to give something that’s long lasting, sentimental and unique. Whether it’s a house warming present, a birthday or holiday, or just something to show someone you care, a thoughtful home accessory can be the perfect gesture. There are two ways you can look at it when it comes to gifting home accessories to a close friend or family member; adding to their already existing theme of pieces and ornaments, or giving them something a little outside their comfort zone, something they wouldn’t ever get themselves. When giving homewares there is a chance to get creative, have a little fun and give a touching present. Typically, when it comes to the big touches in a home, the owner will want to make that call on their own, so when giving homeware as a gift it’s all about the small, but special touches. This sweet blackbird tea towel from Angel & Boho is an ideal gift; the adorable print takes away the functionality aspect of the gift, making it a great addition to a kitchen, to be displayed as a bohemian design feature. Sticking to the bird theme, a simple way to add some life to a garden is with a bird feeder. This rustic piece from Catesby’s is the perfect way to decorate a garden and entice from real birds as well. The piece is great for adding a little charm to an individual tree or a small garden or balcony area. The great thing about giving or receiving homeware as presents is that it’s an opportunity to get an item that you might not be able to justify getting for yourself. Buying something fun, with perhaps just a hint of kitsch that makes a fabulous finishing touch to a home. I love these pin-up candlestick holders from Ark, ideal for putting a smile on someone’s face and lighting up an area of the home, perhaps a table or dresser, giving the space a bit of humour and life. As with many people my age, I’m just being to start a collection of homeware pieces that I’ll (hopefully) treasure forever, so receiving items that I can add to this assembly of ornaments is a great way to give the collection some diversity and give myself new ideas about what I like. Pieces like these multi-coloured candle holders from Habitat are quite a particular style, but if you have someone you know will love them, or someone you think can take on the challenge then they’re a great, creative gift that goes a step further than the typical candle themed gift. My mother has always had a love for flowers and nature, whether it’s in the garden or in the home, so giving her pots and vases has always been a sure-fire way of getting her something she likes (and will use), whilst still being able to get her something with an unexpected design or style. This speckled jug from Catesby’s is a versatile piece that can be used as its primary function, or as a vase. It would make a great accompaniment for some fresh spring Daffodils, with the electric blue and yellow contrasting perfectly. For more of a rustic feel, these antique French pots from Baileys would make amazing gifts, for vases, planters or just ornaments. The individual nature of them means that you can give a few in an array of shapes, styles and colours. If you have a friend, or maybe a son or daughter who has recently bought their first home, or renting their first grown up flat, they may need a few things to help get them started. Whilst a lot of necessities can be bought from places like Ikea, buying some pieces that can give the home a few special touches can make great presents, especially if it’s for someone who can’t justify getting it for themselves. A simple bowl like this one from French Connection is a great starter piece for those finding their style footing. It’ll look great against some simple chinaware sets and begin to add some character to a home. On the contrary, if you know this person has quite an experimental kind of style, and is always keen to try new things and be surprised, an item like this flamboyant tray from Porcupine Rocks is not only a fantastic gift, but also full of flair, making it a real statement piece. Finally, if you’re searching for a gift for someone that already has it all, then something frivolous and fun may be just the ticket. This lollipop holder from Jonathan Adler ticks all the boxes if you’re looking for a present with a sense of humour, individuality and a hint of madness. It makes the perfect addition to an already fruitful collection of eclectic ornaments. Buying gifts for loved ones is a great way to express your appreciation from them, and give them something they’ll love. Deciding to give them homeware means choosing something that they can treasure forever, giving sentiment to their home and help add to the collection of wonderful items. Whether it’s an antique item, something a little outside of their comfort zone, something sweet or an item that encourages them to walk on the wild side of interior design, there is so much fun to be had with picking out gifts, you’ll just have to refrain from keeping them all yourself! If you’re entertaining over the holidays, whether it’s a big party or an intimate dinner, hosting can be made a hundred times simpler with some wonderful tableware pieces that are ready to wow your guests. Whether you’re into the glitz and glam of Christmas or prefer a more low-key or humorous affair there’s always something for everyone. Here are just a few wonderful products that can help turn a party into an amazing evening. Working from the bottom up, an easy way to lay some foundations for a great looking table is with a runner. Gold for a special occasion, this runner from Anthropologie is a great way to give your table an extra little vamp to get into the holiday spirit. Smoke glasses are all the rage right now, but equally have a classic, timeless look. This decanter from Holly’s House is rather elegant, its lovely shape will look just a pretty filled with water or red wine. If you want your glassware to look in sync with one another but not too matchy-matchy, using pieces that follow the same kind of style but with different characteristics will do the trick nicely. Pairing this decanter with these fabulous champagne flutes from Anthropologie will make the perfect match. You could stick to just one colour for the flutes or make your table a little more colourful by mixing it up. Staying on the glamorous party theme, these metallic glassware serving dishes from Anthropologie are sure to be a crowd pleaser. The lace-like metallic effect goes hand-in-hand with the Christmas spirit but will also work exceptionally well on any other day of the year, they’ll give you table setting that extra added touch of magic. If you like to add a little humour to your table, but still want to maintain a wonderful style you can do so with a few little, fun pieces will work wonders with your guests. I love these flamingo salt and pepper shakers from Rockett St George, they are so charming and a great, playful addition to mix among your plates and glasses. Another equally sweet, and also animal themed, product for your table is this wonderful whale bottle opener from Graham & Green. He looks almost like an ornament, but with a secret hidden feature to help you out. Both of these little additions will looks brilliant on a table, but would also make lovely little gifts this Christmas! If you want to add little rustic charm to your table, these napkin holders from Neptune are a great idea. Made from rattan, they’re a great way to accessorize a table if you want keep things a little understated, and will look great paired with some linen napkins in a neutral colour. Presenting your food well is half the battle when it comes to pulling off a dinner party, therefore beautiful serving bowls and dishes are a must, and even if you’re not having a fancy dinner, they can really make something simple look like something from a photoshoot. I love this black and white dish from Rockett St George, the pattern is humble yet so effective and will give your dish an extra flair. If you are having a larger amount of guests, you may need a stylish platter to serve your nibbles on, this charger from The White Company is sure to do the trick. Even if you’re having more of a low-key style party, having a pretty serving dish can make all the difference. These indigo bowls from Holly’s House have a great, relaxed vibe about them, making them perfect for an informal gathering. Finally, for a little ambience, a candle or two on the table will make the world of difference. You’re probably more than likely to already own a whole range of candle holders and have them dotted around your home, but for a dining room table you can’t go wrong with a lovely long stem holder. This King of Hearts candlestick holder from Jonathan Adler is fantastic, its reversible design shows off both a king and a queen and is both a stylish and fun piece to have at your table. A festive party is a great way to have some fun over the holidays, and with so many amazing ways to decorate your table, you’ll want to have a party everyday! I often find myself being nicknamed a magpie, because I’m constantly drawn to shiny things! Although I don’t always appreciate the nickname, I have to admit that more often than not it tends to be true, especially when it comes to home accessories. Metal and metallic items keep cropping up all over our favourite stores and sites at the moment, and with so much range there is something to suit everyone’s style and everyone’s home. So I thought I would share some wonderful shiny accessories with you, to help to start your own magpie collection! This pendant light from Graham & Green is something that immediately caught my eye when I saw it, from its curvy shape to its glistening colour, everything about it fantastic. It’ll make a great showstopper in a high-ceilinged living room or hallway. As you can see from the picture above it really pops out against a green back ground, as it would with a rich blue, but if you want keep things a little more minimal it will look equally as good against a crisp white backdrop. For something else with an equally interesting shape to it, this bowl from Jonathan Adler is a rather fascinating design. Based on seeds, barnacles and pebbles, the bowl is designed to crack slightly during the firing process, which unveils some understated modernist patterns. It’ll make a beautiful centrepiece on a coffee or dining table. Not all metallic accessories need to be contemporary pieces, in fact there are some wonderful, traditional style ideas out there. I love this toilet roll holder from Rockett St George, it’s a great way to add a little antique glamour to a bathroom with breaking the bank. It can work as a simple one-off accessory, or if you want to use the style for a whole bathroom theme, match the holder with a roll top bath and a dark wooden toilet seat. For another dose of glamour, these vintage style candlesticks will add a bit of grandeur to a dressing or dining table, or a mantelpiece. Mix and match the different heights for some diversity, and to make a really dramatic appearance collect a whole cluster of them! If you enjoy a particular style, metal and metallic can always be worked into any scheme. Add a little freshness to a rustic setting with these dishevelled herb pots from Anthropologie. The worn down look will go great with an already established look, while the zing of the colours will give a room a few sporadic pops. If you want something with more of a matte finish, but something still incredibly eye-catching, this bull’s head from Rockett St George is not only a fantastic piece but great take on the traditional animal’s head style. The ornate metalwork will make you feel like you commissioned the piece yourself, but fortunately the price tag won’t! For a room which style follows an exotic home décor, this Moorish wind-light from Lombok is a dream. They’re made by artisans in India with antiqued iron, and are perfect for creating some romantic lighting. This hanging plant pot is ideally suited from a contemporary, urban space. The angular shape gives the accessory more of a masculine edge, and its simple form means it’ll work in a minimal space without altering the tone. Finally, I had to throw in this adorable little etched coaster from Anthropologie, its pattern is super sweet, and will look lovely littered across a coffee table. Whatever you’re style, adding a little bit of metal here and there into your home is a great way to experiment, have some fun, and bring a little freshness to an interior! If like me you’re not quite making it out to a tropical island for a holiday this year, then fear not! 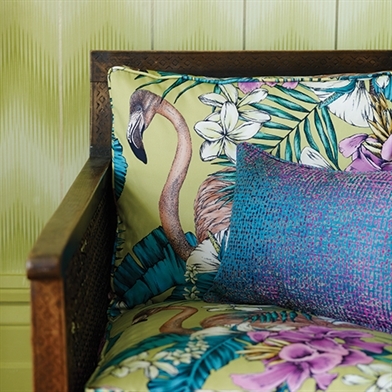 Choose wisely and you can recreate that tropical feeling from your very own home, from quirky and contemporary to classic and stylish, tropical and jungle interiors have been a prominent trend over the last few years and there not going anywhere! I’ve pick out some absolutely scorching home accessories that’ll give you that hot, tropical feeling all year round! Jump straight into the deep end with this extravagant leafy sofa from House of Hackney. Despite its busy pattern the piece of furniture manages to keep its cool, giving off more of a jungle chic vibe than jungle fever! For a mellow hint of tropical flavour, this bedding from Graham & Green is a fun, non-committal way to interact with the style. It’ll look great as a standalone jungle themed piece or act as a lovely base to build upon. The same can be said for this leaf item from Rose & Grey, which combines tropical and glamourous themes to create a beautiful piece. This complementary piece will make a stylish addition to a room and is ideal for storing jewellery or little knick-knacks. Jazz up your hallway with these functional yet beautiful umbrella stand and stool from Lombok. They’re made by artisans in Indian and will really provide a sense of glamour to a hallway or room that is in need of a little face-lift. If you really want to inject some jungle fun into your interiors, there are all sorts of stylish ways to do so. For a talking point, these parrots on perches are just the ticket. They’re perfect if you like your home to have a sense of humour and are a great way to insert a jungle theme into your ornaments. There’s always a lot of fun to be had when picking out a lampshade, with each room there’s a chance to add some individuality and character. New to Rockett St George are these fantastic hand woven lampshades, which work wonderfully with the tropical theme. The frayed ends a reminiscent of grass skirts and the looks as whole feels as if it could be found in a lovely beachside cabana. A few in a cluster would set off the entire look with a swing. For an alternative tropical look for your ceiling lights, take a peek at these Kauai Lanterns from Oka. The playful tassels that rest on top of the shade come in three colours, rust, natural and blue. This design will mix really well with a stylish, contemporary interior that is in need of a little zing. Give an extra little spurt of tropical spirit with this adorable, quirky flamingo light bulb from Rose & Grey, a super addition for kid’s room, or for an adults! Bring your jungle theme back down to eye-level and to your table with these snazzy table accessories. For a simple yet effective piece of day-to-day tableware try these super sweet elephant shakers from Jonathan Adler, they’re almost impossibly cute. And for an exciting and colourful table update, this dinner plate set from Anthropologie will really get your guests talking! An absolute sea of vivid colours and images, perfect for a summer’s evening or even to brighten up a cold wintery night. There’s all sorts of tropical, jungle fun to be had with your interiors and you don’t need to be an explorer to find them! More often than not when I’m gushing over wonderful home accessories, it because the design features an animal motif. It appears that I keep a large, vacant soft spot for all things animal related, from real life bouncy puppies to lamps shaped like monkeys, I just can’t seem to get enough! In honour of our furry friends, I’ve picked out some of my absolute favourite animal themed home accessories that are not only full of style and character but are also perfect for indulging your inner animal-loving self. These ceramic, bear shaped salt and pepper shakers are simply adorable! They’re a modern play on the ceramic figurines you might find at your grandmother’s house, without the dated and twee style. Instead they are full of fun and can be worked into any style. When you combine the world of interior design with the animal kingdom is the outcome is always going to be a fun, playful one. So if you want your sense of humour to transcend to your interiors an animal scheme is always going to be an exciting way to do so. These planters from Anthropologie are wonderful! Coming in either a chicken or hedgehog design they’d fit perfectly into an English country style home, and would decorate a window sill nicely. If you’re taste leans more to the exotic side, then these teapots are sure to take your fancy, I am particularly smitten with the camel design. You can whip them out for special occasions, and use them as ornamentation for the rest of the time. Continuing with the glamorous side of things, Jonathan Adler, who will forever do sophisticated chic how it’s meant to be done, has created a beautiful range of safari animal coasters. With an Elephant, Tiger, Zebra and Giraffe with a gold lustre background to tie them all together, these coasters are a great way to add a spot of luxury to your table. If you’re into the no muss, no fuss interior style but are still looking for that animal chic look, there are loads of ways to include animal motifs into your home whilst avoiding a wild zebra or leopard print! This beaded bee cushion from Sweetpea & Willow is a simple way to add a little intrigue to a room. If subtly isn’t your thing at all, and your more into showing off your wild side and style, then the world of animal interiors is your playground. These monkey lamps from Graham & Green are just amazing, full of style, character and originality. Try it on for size with just one, or go all out with a group all in a different stances, they’ll be a non-stop talking point and will always put a smile on your face. For another original lamp design, House of Hackney have a whole selection of animal style lamps, but my personal favourite is this stacked, porcelain Tortoise lamp. It’s fun, quirky and will help create an individual look to an interior. If you’re looking for something extra quirky, with a hint of the avant-garde, Rockett St George stocks a wonderfully wacky collection of surreal animal trays from Ibride. Whether you use them for either decorative or functional means, they’ll be sure to make a statement! From English countryside to minimal chic, there are hundreds of home accessories that will show of not only your animal loving tendencies, but your style too! Rugs are a significant, but often overlooked part of any room or home. More than just an accessory, if used correctly, they can change a room’s style, atmosphere and overall vision. When buying a rug, people are often quick to jump to a safe option or to a style that they have used in the past, but being brave and taking a chance on a new style or size of rug can be just what a room needs for a little revamp and revitalisation. Finding the perfect rug for your space and taste can be a little tricky as they come in all shapes and sizes, and like a pair of ill-fitting jeans the wrong match for you could be disastrous and could turn your beautiful home into a big old mess. But fear not, we’ve been doing a little research and we’re here to show you the best and brightest in all price ranges to help you to find you rug soul-mate. Once you’ve established your likes and dislikes when it comes to rugs, you can start shopping around. Companies like Graham & Green are a great place to start as their selection is well stocked and their prices reasonable. This is a charming take on a Moroccan style rug, and could be easily worked into an already decorated room. If you’re looking for a small rug to allocate a space in a room for a few chairs and a table, or a comfy seating area, Graham and Green have some lovely circular rugs in a few styles, which are ideal for creating an individual space inside of a larger room. There is always a pattern vs plain debate when it comes to picking out rugs, and ultimately it boils down to your taste and the room itself. If you want a plain rug it would be best to make sure you add colour or a pattern in another component of the room for example the walls or curtains so that the room doesn’t become too washed out. This elegant rug from Scottish designer Anta is the perfect plain rug to complement other styles and colours you may want to include. When a room is in need of a contemporary and quirky patterned rug, either to set the pace or follow suit, there are a few designers you can try. Jonathan Adler always brings a sense of fun and originality to his designs and has a wide range to complement your style. This enjoyable design from Adler is the perfect companion to a modern home, and can be the only splash of colour needed if you’re into more of a muted, minimalistic look elsewhere. If you like your interiors to have a playful edge, and you’re a sucker for a faux animal print, this zebra rug is simply to die for, especially since no animals did! Stair runners are an amazing way of decorating a home, and one of the best place to go in search of runners is Alternative Flooring. They have a wonderful range of styles and colours, and can tailor their designs to your specific needs. This beautiful monochrome design will add a bit of pizazz to a neutral hallway and help create a welcoming atmosphere as well as a style statement upon entering your home. Another contemporary style from Alternative Flooring is the Rock ‘n’ Roll Roxanne design which would be perfect for updating a home’s interior into a modern look. When it comes to choosing a rug’s size, it’s generally best to follow the ‘bigger the better’ rule. If you buy a pre-made rug the standard size is usually around 300x200cm, although it will always vary depending on which store or website you visit. If you have a large space to play with, you’ll want to make sure that you don’t end up with a rug that’s too small and therefore disturbing the room’s ambience and flow. One way to get around this is to order a section of carpet and have the edges bound. This gives you flexibility on the size and can be quite cost effective. We did exactly that with a client with the brilliant Crucial Trader. Niki Jones creates some wonderful classic contemporary rugs, as well as cushions and linens, which can be custom made into any size you like. The possibilities are fairly endless when it comes to rugs, big or small, plain or patterned, classic or contemporary, expensive or cheap. Start thinking about what you would really love on your floor and then track down the right supplier, this will save you from being overwhelmed by choice! This week at Angel + Blume we’re in love with big, bright and beautiful colours, and we want you to fall in love as well, so we’ve put together some of our favourite collections of the best and brightest designs you’ll see this season. Fortune favours the brave and you won’t be disappointed if you decide take the leap of faith and go all out with these outstanding designs. What first inspired us to write this blog was seeing the beautiful advert for the new Diane von Furstenberg collection for Kravet. Although this might be a little full-on for some people and their homes, the colours and patterns are exquisite and would each make an outstanding statement piece individually. For a less bright, but equally dynamic look, see the Funky Zebra pattern from the DVF collection. The cool blue tones allow for a more understated style, whilst the pattern keeps the fun flowing. This season Kravet has also teamed up with Jonathan Adler for another dazzling collection, and it’s just the thing if you’re looking for a little retro boost for your home. There are very few people who do bold and beautiful better than Dominic Crinson. His wallpaper and tile designs are everything you’ll need to channel your flamboyant style, and if you’ve got the moxie, your home will shine with originality and flair. Although not for the faint hearted, Crinson’s designs are gloriously avant-garde, perfect for a modern day home or even to spice up an old period house. If you’re in the market for some beautiful tiles, but are finding Dominic Crinson’s style a little overwhelming, Emery and Cie may be just the ticket. They’re style is still bold and beautiful, but with more of a classic edge, the collection ranging from Iznik influences to Art Nouveau, here are just a few of my favourites. The Faux Iznik tiles from Emery and Cie are perfect for adding some exotic, heritage style into your home, ideal for a fireplace or bathroom. These Fez Pottery designs, which come in these wonderfully tranquil turquoise hues, would make a lovely feature in any room, and are a timeless piece that will interact with most styles seamlessly. Another beautiful design from Emery and Cie are these sweet Mirror Scale tiles. They’d make a stunning frame around a mirror or cabinet but if you really want to go for something eye-catching then be brave and cover an entire wall in the tiles. Going a little more low-key but still sticking to some exciting block colours, you can dress up the front of your cabinets with these lovely designs from Superfront, a company that creates fronts, handles, tops and legs for popular IKEA cabinets. Available in a variety of colours and patterns, they’re a great way to reboot your kitchen or any cabinet pieces without remodelling, and are great for updating your home as your style or colour preference changes. If you are a fan of wild colours for your interior why not dive in at the deep end and paint your walls with some bold colour choices, no one ever said that a blank canvas needed to be white. Designers Guild has some wonderful paints, and this TG Green is amazing with just the right amount of outrageousness. If you want to treat your walls (and your eyes) to some daring wallpaper, look no further than the king of patterns and prints Matthew Williamson. His Cuban influenced collection for Osborne & Little combines retro glamour with contemporary colours and will have you spoilt for choice. I love this palm tree wallpaper; it’ll turn any room into a little paradise, and the same can be said for this flamingo and flower print, shown here as a fabric. My absolute favourite design in the collection though is this wonderful Arini wallpaper. The contrast between the metallic background and the colourful parrots is playfully elegant; it’ll exhibit your style whilst also showing that you don’t take life too seriously. Though you need your home to be liveable and functional it doesn’t mean that you need to steer clear from the element of fun, these designs and collections are perfect for keeping your spirits up and putting a smile on your face.